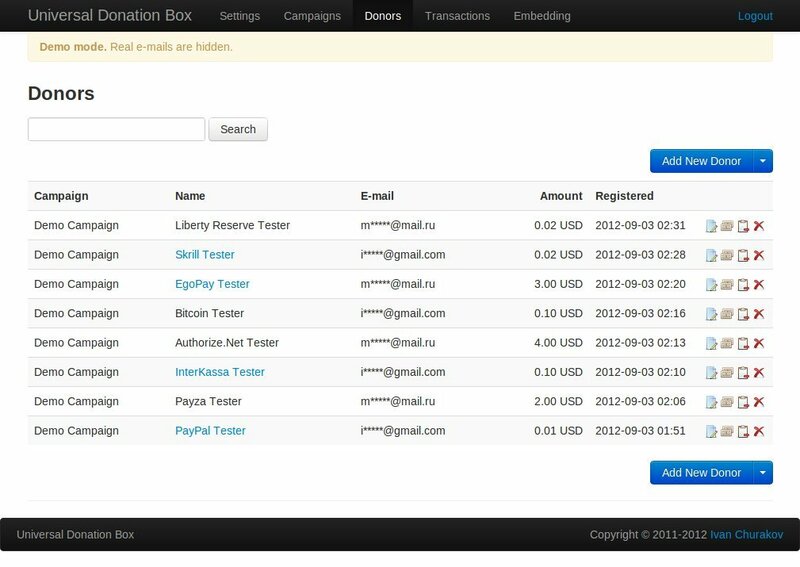 Universal Donation Box is a powerful donation manager for your website. It handles unlimited number of donation campaigns, supports multiple payment gateways (PayPal, Payza/AlertPay, Skrill/Moneybookers, Authorize.Net, InterKassa, Perfect Money, BitPay and Stripe) and can be easily integrated into any website (no more difficult than insert Facebook Like button, check out steps 5-6 in “Installation” paragraph). Universal Donation Box is the easiest and perfect way to monetize your website. Handle donations on website: use this script to handle donations. Accept major credit cards – Visa, MasterCard, American Express: credit cards payments are accepted through Stripe. Minimum donation limit: set minimum donation limit. Unlimited campaigns: handle (create, edit, delete, block, unblock) unlimited number of campaigns. Modern donation form: HTML5 + CSS3, AJAX-ed donation form. Display top donors: script can display top donors. Display recent donors: script can display top donors. Content editor: insert any HTML-content inside of donation box. CSV Export: all donors can be exported as CSV-file. PHP mail() function supported: emails can be sent through mail() function. SMTP supported: emails can be sent through SMTP server. 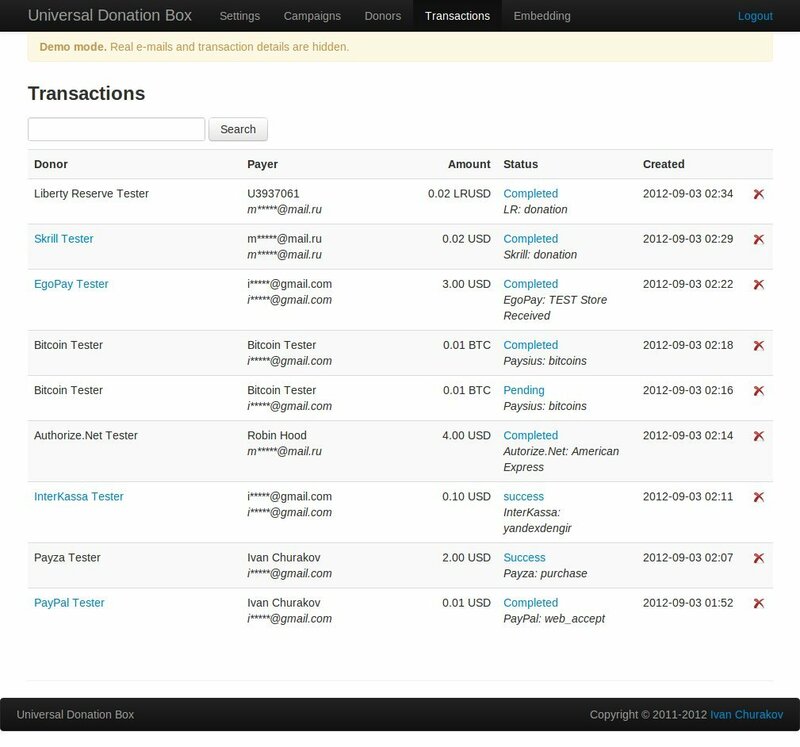 Click “Live Preview” or visit demo website to see how Universal Donation Box works. Make sure that folder donation-box has permissions 0755 and php-files 0644. Go to admin panel http://www.website.com/donation-box/ using default login/password (login: admin, password: admin), configure script on Settings page and create at least one campaign on Campaigns page.